Discover your strengths, find support and learn to thrive! It’s also a place where corporations and supervisors can find understanding and support for dealing with employees who have ADHD or ADD-like symptoms. I am so excited and proud! I am a contributor in a second new book that was written just for you! 365 +1 ways to succeed with ADHD, a book co-authored along with 80 other ADHD experts and professionals from around the globe. 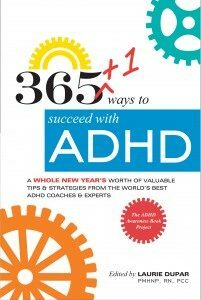 365+1 ways to succeed with ADHD is a whole new year’s worth of tips and strategies from the world’s best ADHD Coaches and Experts. There is a full year of tips and strategies to succeed with ADHD, written with parents, children, adults and college students in mind: all in bite-sized ADD-friendly format. There is something for everybody! Within its pages is that tip or strategy you have been looking for. I don’t want you to miss out! Click to call to now to set up your first conversation or to ask questions! Or send me an email through my contact form. They come straight into my email box.